A couple of days ago I noticed our local supermarket was selling small frozen racks of veal at a special price. As veal isn’t always readily available any more I bought a rack without thinking what I’d do with it. 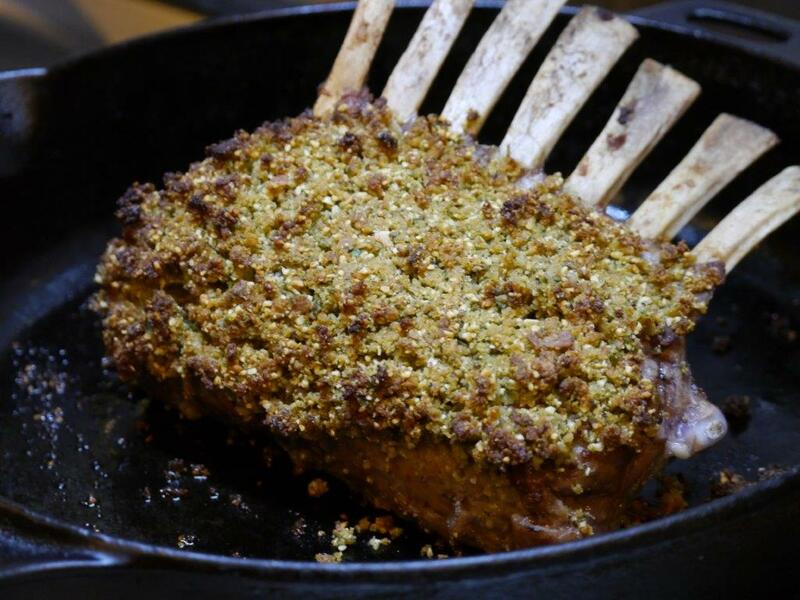 Once home I decided to simply roast it with a herb crust. This mixture would also work well with a rack of lamb and even as a topping for a piece of oven baked fish such as monkfish or cod. Bring the rack to room temperature. Season the meat well. Heat a little oil in a heavy oven proof pan and sear the rack quickly on all sides until lightly browned. Set aside. Place the rest of the ingredients in a food processor and process until you have medium to coarse crumbs. Add a dash of olive oil if it needs moistening. Press the crumbs onto the rack of veal. Roast at 180-200°C pre-heated oven for about 30-35 minutes. (A rack of lamb will take a little less time). Let the rack rest, covered, for at least 5-10 minutes. Its great served with a mushroom and red wine sauce.